You will need a recent version of Node and npm installed on your machine. A basic understanding of React or Preact will be helpful. 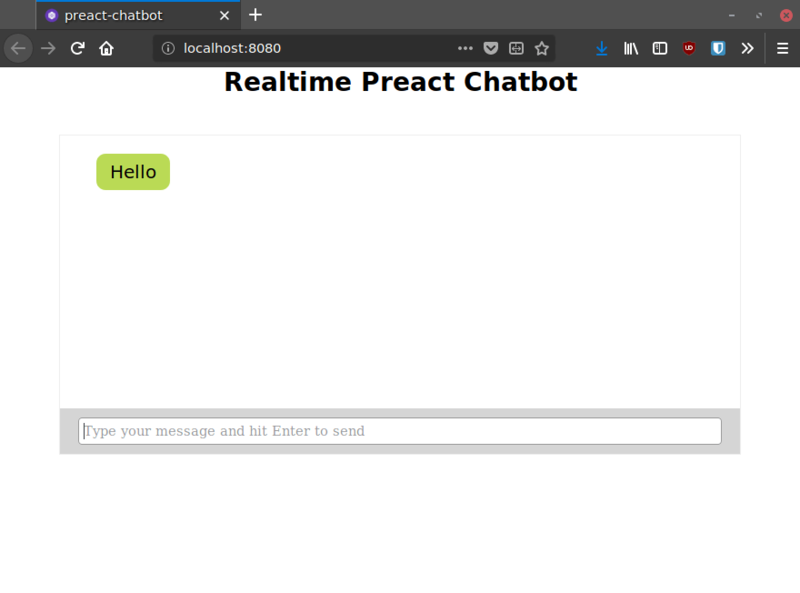 In this tutorial, we will consider how to build a realtime chatbot that incorporates NLP using Preact, Wit.ai and Pusher Channels. You can find the entire source code of the application in this GitHub repository. Chatbots have become more and more prevalent over the past few years, with several businesses taking advantage of them to serve their customers better. Many chatbots integrate natural language processing (NLP) which adds a more human touch to conversations, and helps them understand a wider variety of inputs. Before you continue, make sure you have Node.js, npm and curl installed on your computer. 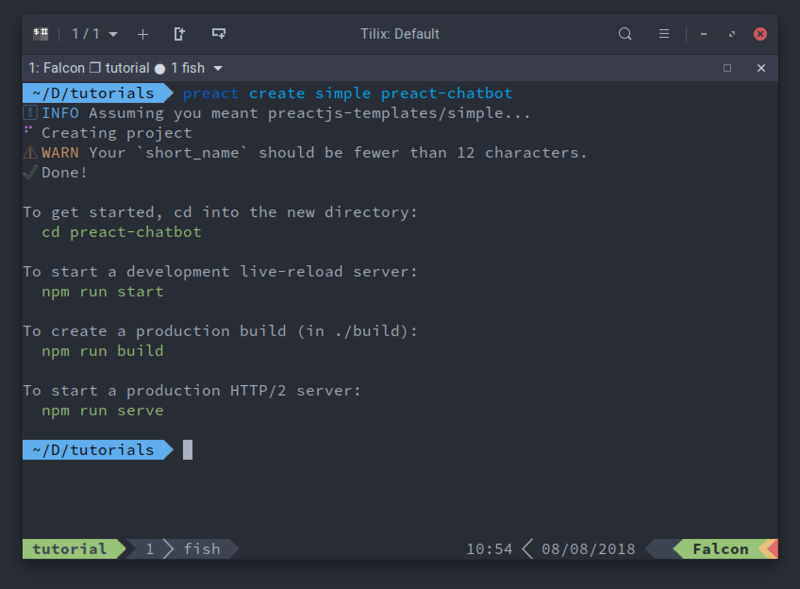 You can find out how to install Node.js and npm here. I believe the code will still work even if you’re on an older version of Node, but if you have any trouble completing the tutorial, try upgrading to the versions I used to see if it fixes your problem. Also investigate how to install curl on your favorite operating system, or use this website. 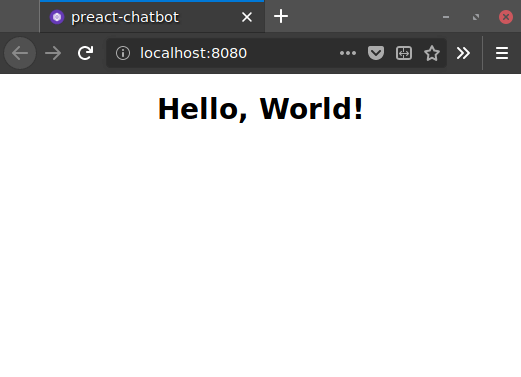 Let's bootstrap our project using the preact-cli tool which allows us to quickly get a Preact application up and running. 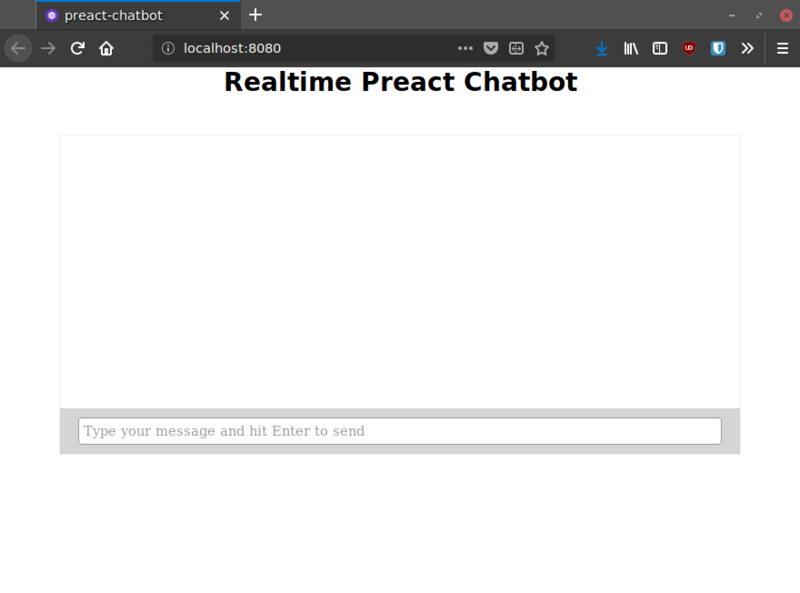 The above command will create a new directory called preact-chatbot and install preact as well as its accompanying dependencies. It may take a while to complete, so sit tight and wait. Once it’s done, you should see a some information in the terminal informing you of what you can do next. Next, change into the newly created directory and run npm run start to start the development server. If you have some experience with Preact or React, the above code should be straightforward to understand. The state of the application is initialized with two values: userMessage which contains the value of whatever the user types into the input field, and conversation which is an array that will hold each message in the conversation. The handleChange function runs on every keystroke to update userMessage which allows the displayed value to update as the user types. When the user hits the Enter button the form will be submitted and handleSubmit will be invoked. handleSubmit updates the conversation state with the contents of the user's message and sends the message in a POST request to the /chat endpoint which we will soon setup in our app’s server component, before clearing the input field by setting userMessage to an empty string. Head over to the Wit.ai website and create a free account. Once you are signed in, hit the + icon at the top right of the page to create a new application. Enter your app name and click the +Create App button at the bottom. You should see the following page once your app has been created. Wit.ai uses entities to help you understand user queries and extract meaningful information from them. Let's setup an entity that will enable our bot to understand common greetings like "Hi" or "Hello". Type the word "Hello" in the "User says…" input field, then select the “wit/greetings” entity in the Add a new entity field. Use the dropdown on the right to set the value of the entity to true. Once done, hit the Validate button to add the entity to your application. You can repeat the steps for other greetings such as "Hi", "Hey", "Good morning" etc. If you click on the wit/greetings entry at the bottom, you will be directed to the entity page that contains all the expressions under that entity. wit/greetings is an example of a built-in entity. These built-in entities are prefixed by wit/, and are defined to extract common expressions from messages. Things like age, money, email address, location and the likes are all covered by Wit.ai’s built-in entities. You can train our bot to understand other things that the built-in entities do not cover. For example, let's add an entity that allows our bot to understand a request for a joke. Type "Tell me a joke" in the User says... input field, and add a new entity called "getJoke". As before, use the dropdown on the right to set the value of the entity to true and hit the Validate button. Go to the settings page, and type "Hello" in the input field that says Type something to cURL, then copy the command to your clipboard using the copy icon on the right. Open a terminal window and paste in the command, then press Enter. This would produce some output in your terminal that shows the entity that your query matches. 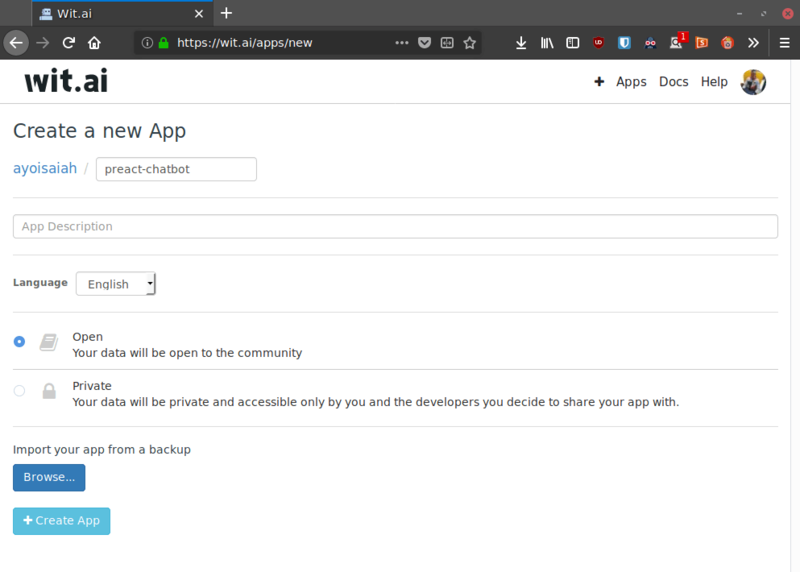 We need to setup a server component so that we can pass messages sent through the frontend of the app to Wit.ai for processing. We've also set up a /chat endpoint that receives messages from the frontend of our app and sends it off to the Wit message API. Whatever response is received is then logged to the console. Before you start the server, create a variables.env file in the root of your project directory. You should add this file to your .gitignore so that you do not commit it into your repository by accident. You can grab your Wit.ai server access token by heading to the settings under API Details. 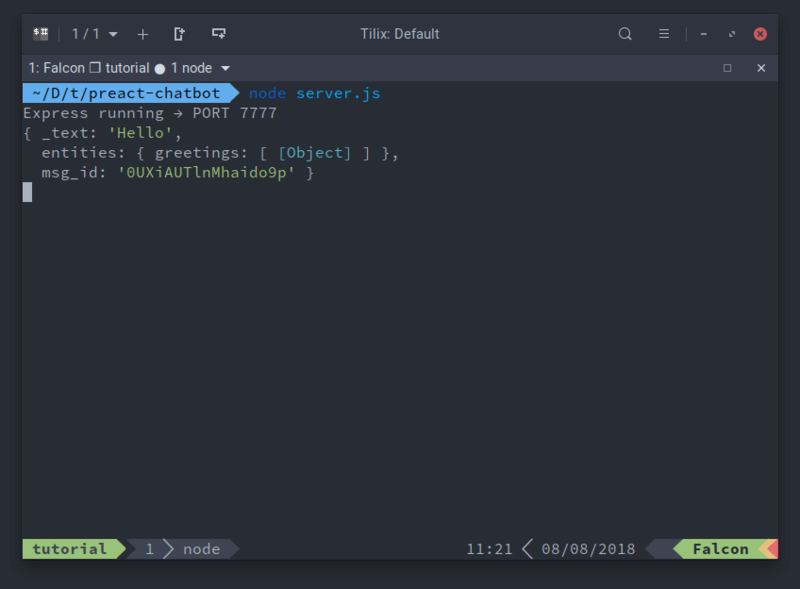 Now, send a few messages in the chat window, and watch the terminal where your Node server is running. You should see some output in your terminal that shows the entity that your query matches. Now that user messages are being passed on to Wit.ai successfully, we need to add a way to detect which entity was matched and send an appropriate response to the user. We'll achieve that by setting up a responses object that contains a variety of responses for each entity that we defined, and then send a random message when the appropriate entity is matched. Once we find an entity that matches, a random message from the appropriate property in the responses object is logged to the console. Otherwise the default response is logged. Now, let's integrate Pusher into the app so that our bot can respond to the user in realtime. Head over to the Pusher website and sign up for a free account. Select Channels apps on the sidebar, and hit Create Channels app to create a new app. Next, we’ll open a connection to Channels and use the subscribe() method from Pusher to subscribe to a new channel called bot. Finally, we’ll listen for the bot-response on the bot channel using the bind method and update the application state once we receive a message. Don’t forget to replace the <your app key> and <your app cluster> placeholder with the appropriate details from your Pusher account dashboard. Stop the node server if it is currently running by pressing Ctrl + C in the terminal and restart it with node server.js. Now you can go ahead and test your bot! 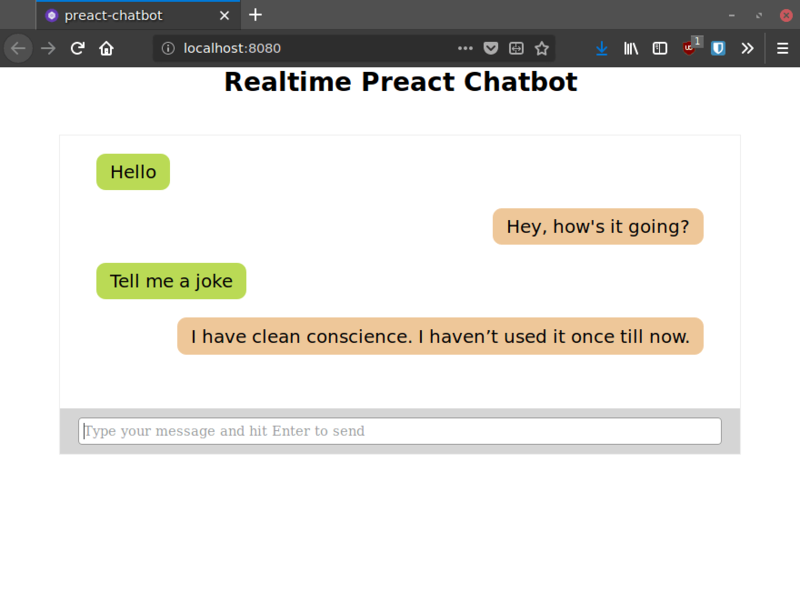 Send messages like “hey”, or “Tell me a joke” and you will get replies from the bot. 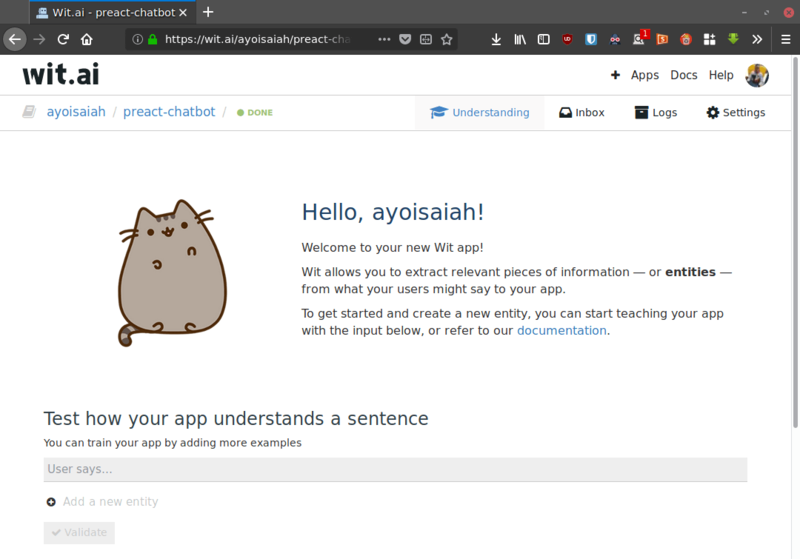 You have now learned how easy it is to create a chatbot that incorporates natural language processing with Wit.ai and how to respond in realtime with Pusher Channels.